To avoid creating Data API requests from scratch, Arcadia Enterprise provides access to details of the data requests. Open an existing dashboard. We selected Cereals. Use the keyboard shortcut Shift + Control + G to open the Performance Profile interface. Hover over a line that represents a visual ID (we selected 377), and view the duration, type, and details of the query that runs against that visual. 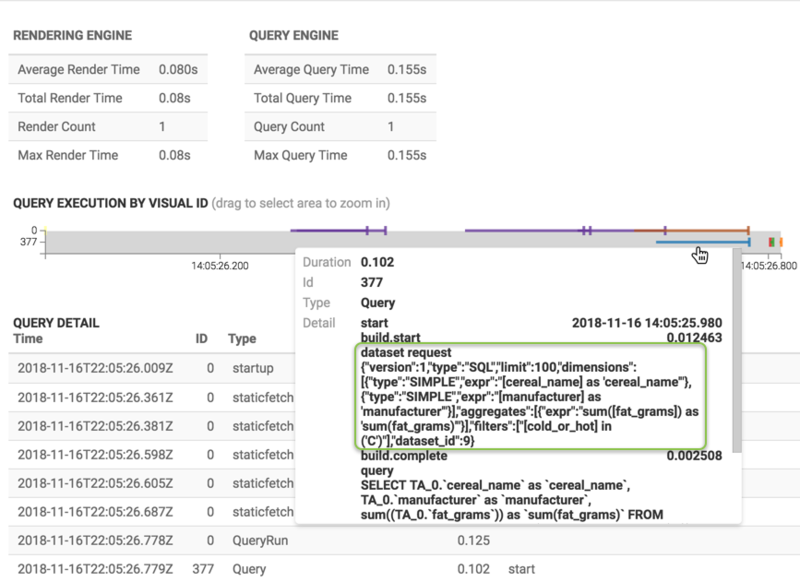 The query uses the same API and includes the details of the data requests. You can use this dataset request as the payload for your Data API call. For more information on using the Performance Profile interface, see Monitoring Dashboard Performance Profile.